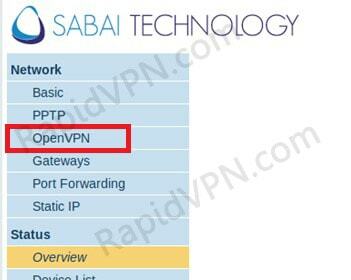 How to setup OpenVPN connection on Sabai Router? 1First you will need to download the OpenVPN configuration file for the server location of your choice from this link http://rapidvpn.com:3030. Download OpenVPN UDP/TCP configuration file. Note: In this tutorial we imagine you want to configure your router for Germany server. 2Access your router's web management page, 192.168.199.1 (by default for sabai router) and go to the "Network -> OpenVPN"
4Click on "Show File" and then "Edit"
5Enter your vpn username/password and fill-up other fields as shown in below image and click "Save"
7To disconnect VPN, click on "Stop"